My daily news reading always involves a quick peak at the headlines aggregated by the editors of the website, Arts and Letter Daily. Late last week, this headline caught my attention, "George Santayana thought highly of himself – and little of others, especially his Harvard colleagues and their “trivial and narrow scholarship”... more»". 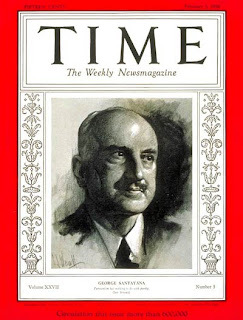 What a wonderful headline, I thought, and clicked through to an interesting article on George Santayana, one of my favorite authors to both read and collect. The link was to an article in The Weekly Standard, a review of a new Santayana selection of essays and a related title. I imagine that destination might have ruffled the feathers of many loyal Arts and Letters Daily readers as the traditional audience of the respective sites rarely interact. My interest in Santayana has a similar irony in that I am a devoted fan and lifetime student of Immanuel Kant and his transcendental philosophy which Santayana disliked. Santayana was a philosophical naturalist, before philosophical naturalism was a movement and he disliked Kant's transcendentalism because he felt it ignored the facts to be discovered via the natural sciences. Luckily, I don't need to adhere to any consistency when it comes to philosophy or in my book collecting pursuits. I still read and study Kant but don't collect Kant(ian) books. I still read and enjoy Santayana and I do collect his books. Santayana was born in Spain but raised in Boston on Beacon Street among the Boston Brahmin. He earned a doctorate in Philosophy from Harvard University, writing his dissertation under the guidance of Josiah Royce and was a Professor in the Department from 1888 until 1911. In 1912 Santayana left America and resigned his position at Harvard University. He resignation was for cause, the cause, his dislike of the way philosophy was done at Harvard and Santayana went public with his opinions. Santayana was not only a Professor of Philosophy but also a supremely gifted and talented author of philosophy, essays, poems, drama, letters and one masterpiece, novel. Many of his books remain in print because even now, a century removed from his time, his writing remains fresh, his ideas motivate reflection and he was a defining American Philosopher of the 20th century. A critical edition of the complete works of Santayana is being edited by a team at IUPUI and published by The MIT Press. To date, 5 volumes have been published in 14 books (Volume 5 comprised 10 books of letters). This critical edition is slowly moving along but with 24 more volumes to be edited and prepared for publication, it may be another 100 years in the making! The first 4 volumes are out of print and sadly, don't even show up on the web page for the Series listing. While I was an Editor at The MIT Press, I was the publishing contact for the Series and since I considered myself part of the market for the books, I could never take a complementary copy since the market was very small, especially for the 10 books of Volume 5! I have some catching up to do if I want to acquire the 14 books published to date and be prepared for those to follow. Collecting Santayana is fairly straightforward. He was a prolific writer and a best selling author and there is a solid supply of affordable original editions of his books. A simple search for first edition, hardcover, books by George Santayana published between 1888 and 1940 results in list of 263 titles with only a handful priced over $100. A good place to start a Santayana collection is with his only novel and one of my favorite books of all times, The Last Puritan: A Memoir in the form of a Novel, Charles Scribner's Sons, New York, 1936 (Constable, London, 1935). Be careful when thinking about acquiring a first edition of this classic book. I once acquired a copy that the bookseller assured me was a 1936 first edition, first printing and for $18.00 I believed him. Later, I realized that a true first edition would have included an "A" on the copyright page and the backcover list of Scribner's Santayana titles included books first published in the late 1940's! Since Santayana believed that his philosophical work and his writing overall was American to the core, I believe that collecting the US publications is the way to go rather than the sometimes, earlier, UK editions. Turning to Santayana's philosophical work, the 5 volume, The Life of Reason, including Reason in Common Sense, Reason in Society, Reason in Religion, Reason in Art and Reason in Science is essential. These are fairly scarce but at least, copies that are available are reasonably priced. After reading and collecting The Life of Reason Santayana's memoir Persons and Places is the next obvious choice as it is considered one of the great memoirs of all time. Persons and Places was published in three volumes including The Background of My Life, The Middle Span and My Host, The World were all published by Scribner's. My personal interest is in acquiring either the original publication of The Genteel Tradition in American Philosophy or the first collection of essays where it appeared. Collecting Santayana is collecting for reading and thought and a Santayana section is a must for anyone developing a private library with an interest in the American tradition of philosophy and the history of ideas. For a wonderful introduction to Santayana and his philosophical and literary character, Irving Singer's, George Santayana Literary Philosopher, Yale University Press, 2000 is a great read. According to Book Collecting 2000 Santayana's 'Lines on leaving the Bedford Street Schoolhouse'(Boston 1880)is the author's first publication, even though it was only 4 pages long. It is an exceedingly rare item, worth arounf $750. Can you or anyone else tell me more about this publication ?